Hello Tuhon Rommel Tortal, thank you for this interview! Well, can you talk a little bit about yourself and your involvement in martial arts? Well, I started training Pekiti Tirsia when I was very young with my uncle, the Grand Tuhon Leo Gaje. Early I received an intense training, a very hard training. The years passed and as I developed technically and I also develop my courage and humility through that same training. The Pekiti Tirsia helped me to me to develop the perspective that today I have about life today. Until now I continue training with Grand Tuhon in the Philippines. I regularly visit him so I can continue to develop my skills. In addition, throughout the year I travel several times around the world to propagate Pekiti Tirsia, teaching civil, military, security forces, special operations and different agencies. So I just to have the opportunity to see different perspectives of training with guns and knives. I do the tip in order to show to all those people who do I contact the tactical part of the Pekiti Tirsia. 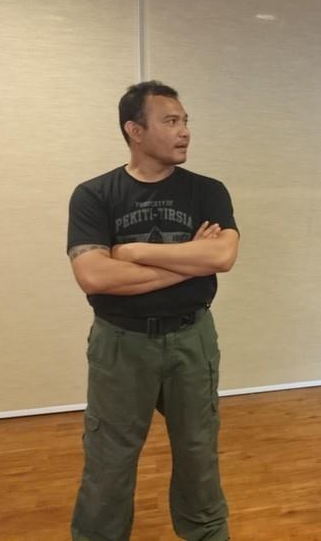 Today I can say that my main occupations are: Pekiti Tirsia to teach military forces and act as a consultant for technical and tactical subjects in different security companies around the world. It makes me very happy, so that I can show my art and teach more and more people. Can you explain a bit about the Tri-V? The Tri V is the most advanced teaching process we have within the Pekiti Tirsia methodology, which focuses on operational functionally of the knowledge obtained by our students. Pekiti Tirsia is a main system, which is composed of different subsystems as Doce Methodos, Seguidas, Contradas, Contra Tirsia Dubla Doz, Dagaso Tirsia, among others. It is necessary that the practitioner can connect one to the other. What is done with the knife to what is done with two sticks, for example. So the Tri-V is the bridge to connect with consistency all this knowledge in a functional way, applicable and consistent in a single philosophy. Can you explain to our readers, as the Pekiti Tirsia today is organized an international level? Today's leading organization Pekiti Tirsia is called Pekiti Tirsia Kali Global Grand Alliance. An umbrella organization comprising various associations for itself specific purposes. For example, the Pekiti Tirsia Tactical Assocation, which is an association that seeks to join practitioners of Pekiti Tirsia that are more related to military matters or related to security. Also we have other groups Pekiti Tirsia as the Texas Association, Pekiti Tirsia France, Asia Pacific Association among others. These are all sub organizations within the Global Grand Alliance, which is led by me and composed by others senior instructors of Pekiti Tirsia. This is your first visit to Rio de Janeiro, isn´t? Can you tell us what you think about the city? The Rio de Janeiro is a great place! The people are friendly and I enjoyed the nature, the contrast between the beach and the mountains and a city in the middle! You can be at a time on the beach and then immediately at mall, and I liked this variety! Oh yeah, and the food here is also great! And what are the plans for the future of the Pekiti Tirsia? 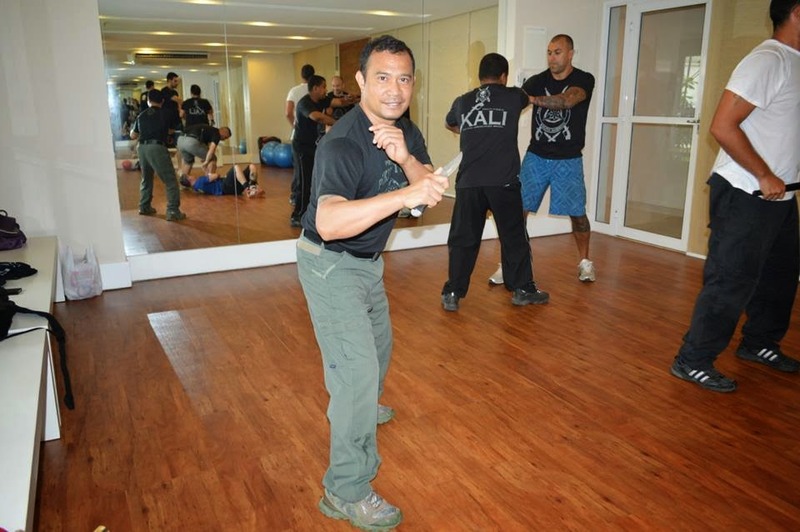 The main plan of the Pekiti Tirsia is to propagate, to spread the Filipino martial art and to promote our system, sharing with those who love this type of training. In addition we are focused on strengthening our system here in Brazil and hope one day have a Pekiti Tirsia instructor in each city - but that quality and respect. So to reach that goal we need dedicated people with good technical level and are really engaged with the philosophy of our school. And what is your opinion on the work being carried out in Rio de Janeiro and São Paulo by Pekiti Tirsia South America / Brazil PTTA and Agalon Mickaël Dolou? The work of the Pekiti Tirsia South America / Brazil PTTA is excellent and I see that Agalon Mickaël Dolou is a great person with a true spirit of leadership, great technical quality! The way that he teaches these guys is intense and I could see at the seminar that the spirit of Pekiti Tirsia is here! This is one of the most important things that I notice in the places where I visit, because if I see that students are good is that the teacher is good. No doubts about the Agalon Mickaël Dolou is one of the aces of Pekiti Tirsia! Thank you for Tuhon interview! You can leave a few words for our readers? Thank you for this opportunity. I like that people have the opportunity to read about the principles and the Pekiti Tirsia goals. Our goal is to promote the art. So I leave an open invitation to all who seek to engage and train hard to join us. We are happy to embrace all those who want to train our system with seriousness, dedication and focus in the art. We are a martial artists that seeks to create friends and working to avoid politicking and competitions. 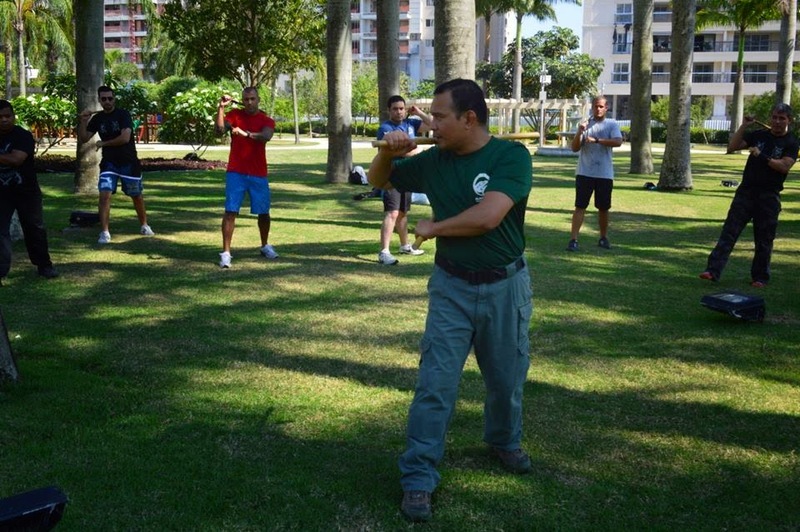 We like to have partners in different arts, for so we can share more and more Filipino martial art and demonstrate efficiency of Pekiti-Tirsia. 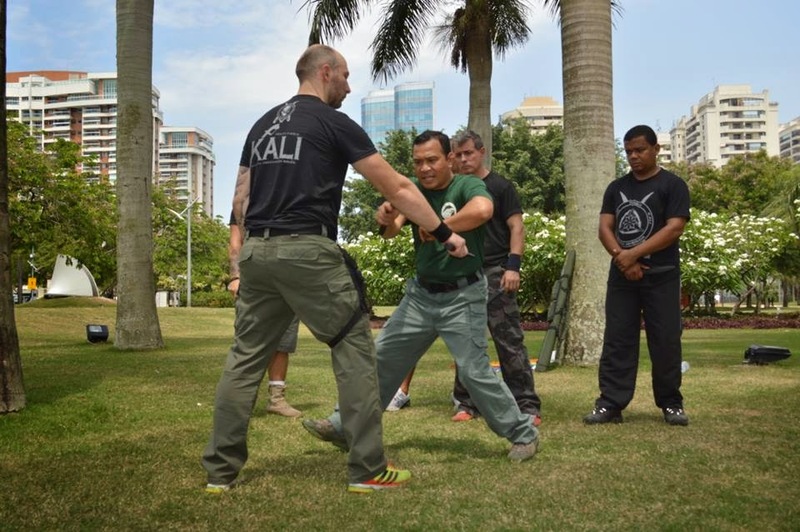 Note:Mickaël Dolou is the Director and lead instructor of the organization Pekiti Tirsia Kali South South America and of PTTA Brasil, under the leadership of Tuhon Rommel Tortal and Tuhon Jared Wihongi. Two years ago, he was promoted and received the title of Agalon [...]directly from GrandTuhon Leo.T Gaje Jr, as his direct student also. During this visit Tuhon Rommel Tortal entrusted Agalon Mickaël with the use of the Hiligaynon (Ilonggo) appellation "Kaliradman" to characterise his practice judged "intense and hard, genuine and with intent and without reservation". Agalon Mickaël later clarified to us that it was a strong encouragement from the senior Master to maintain and devellop the spirit of his practice and teachings of Pekiti-Tirsia while develloping the key associated attributes of good moral standing, good heart and leadership. He also explained that the objective is to keep reflecting to the best upon the teachings received which are unvaluable, hence pay adequate respect thereto, and as expressed by Tuhon Rommel Tortal, to participate actively in the delicate mission to preserve and protect Pekiti-Tirsia in its purest indigenous form.